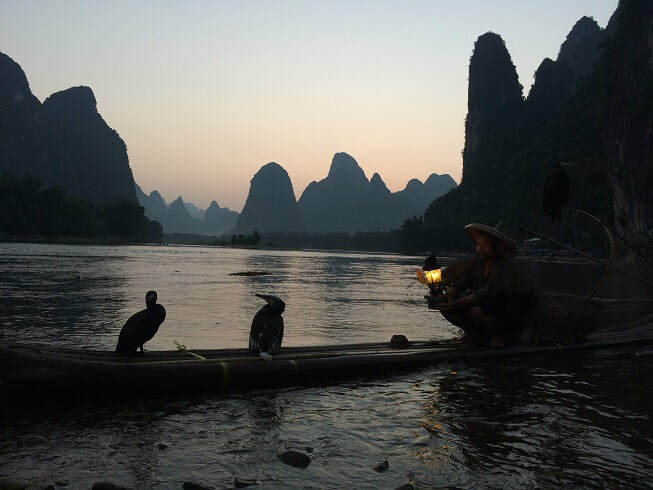 An Imminent feature of your Yangshuo Travels would be the experience of witnessing Cormorant Fishing along the Li River. We all know the traditional methods of fishing with nets and fishing rods but opting to witness this would enable you to open your mind to new realities being practiced in the Ancient Chinese Culture. A Cormorant is a very large bird known to feed on fish and is precisely apt at the practice of fishing. Cormorant Fishing has been practiced in various parts of China and Japan for over centuries making it almost an ancestral way of catching fresh fish. A well trained Cormorant is a valuable asset to have for any fisherman and is known to feed its own as well as its owners’ family every day. A fishing show is held each evening, whereby visitors board a boat and follow Cormorant Fishermen down the river watching the birds catch fish and return them to the fisherman’s boat. The fishermen have a thread tied around the neck of the Cormorant to prevent it from swallowing the larger fish, whilst it’s still able to swallow smaller fish. The thread enables the fishermen to pull the bird back into the boat and give up the large fish stuck in the throat of the Cormorant. To some this even may seem a bit cruel but it has been occurring for centuries and is an Ancient Chinese fishing practice. Due to lack of quantity with this particular fishing method, the fishermen have moved onto more efficient ways of fishing but some still believe that this is the most hassle free way of fishing invented by man. So take time out of your Yangshuo Tour and experience the Cormorant Fishing Show, which is held each evening in Yangshuo. At night, visitors are welcome to take a short boat ride and experience a traditional Chinese fishing method (that is still practiced today) -cormorant fishing. The fisherman is accompanied on a bamboo raft with several trained cormorant birds with a piece of grass loosely tied around their neck. The birds then dive under water, hunting for fish and returning their catch to the fisherman. This is a unique and interesting experience, where visitors can get up close and view this traditional practice. Interested in seeing Cormorant Fishing on a Tour? Wendy Wei Tours offers a variety of different packaged tours as well as custom tours including Cormorant Fishing, among other attractions and destinations. To find out more, please visit our Tours page or Contact Us directly to find out more.